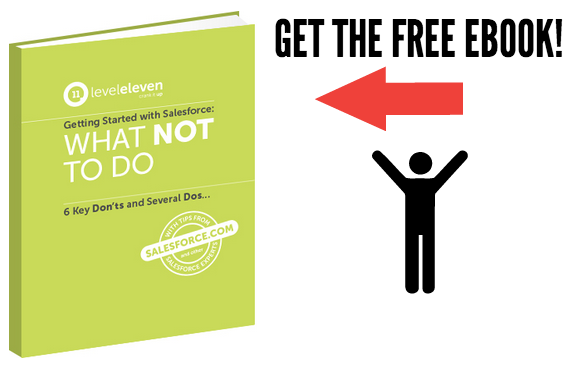 Implementing Salesforce is a big deal. There’s a lot of time, energy and effort involved for everyone on your team – not to mention that CRM is a serious investment. To get the most ROI, you should know what you want to get out of Salesforce, as well as how you’re going to get there. To get a little advice on this, we tapped into Torrent Consulting’s Andrew Cann. He’s worked with numerous organizations, from international Fortune 100 companies to public sector agencies and nonprofits. Sales leaders, here are four vital steps for getting started with Salesforce (plus advice from Andrew). 1. Determine what implementation success means for your team. What are you hoping to get out of the application? How will you define a successful implementation? Every sales leader has to generate their own goal. For many, it’s to get reporting analytics and insight into their pipeline. Others want to see more consistency in the way reps manage the sales process. And some might just be looking to make their organization mobile. So ask yourself: What would you like to get out of the platform? Then determine how you will measure success. 2. Define your fundamental sales stages. You want your CRM to reinforce your sales process, not define it. If you haven’t mapped out your sales process and the fundamental stages that it involves, do that well before a Salesforce rollout. Work with both your sales managers and reps to determine what steps best describe the journey from discovering a potential opportunity to closing a deal. 3. Distinguish the activity metrics that drive the sales process. From here, you’ll need to pick out the sales activity metrics you want to measure: What specific behaviors drive opportunities from one stage of your sales process to the next? These are leading indicators – things like calls, meetings, product demos and proposals sent – that you can measure and manage. Your activity metrics must be specific to your team. Activity metrics for a sales development rep might include number of calls, conversations, meetings scheduled and opportunities generated. But an enterprise sales rep’s process would probably benefit more from senior buyer connections, VP-level conversations, ROI discussions and negotiations. In the end, settle on 3-4 behaviors you’d like each team to focus on. 4. Design Salesforce around your sales process. Once you understand how your sales process works, you can start to design your Salesforce platform in a way that aligns with it. That means implementing the stages of your sales process into the system, as well as creating a way for reps to log their corresponding activity metrics. “[For adoption], it’s important to define your metrics up front and clearly share them with your team so they know that everyone is working toward those goals together,” Andrew said. Use these tips to ensure that your CRM is both easy-to-use and valuable for reps. And for additional advice, check out our podcast on steps to improve sales rep adoption. Sales leaders, here are four vital steps for getting started with Salesforce with advice from Salesforce Consultant Andrew Cann.